Her first single was “I Don’t Wanna Be a One Night Stand” back in 1976. It’s 2010 and she’s far from a one hit wonder. “Turn On The Radio” debuts on the hot 100 this week. It’s the 91st single of her career. Between her and George Strait, I am blown away by the longevity of the careers of country artists. Can you envision some current pop artists having such huge careers? 91 singles worth of Ke$ha? 20+ years of Beiber songs? I heard this song a few weeks back as it had climbed to the top of the charts in the UK and said to my girlfriend, “That’s one of those songs that’s a big hit in the UK and will never be a hit in the States”. I stand corrected. It’s a strange little dance track, built around an Italian song from the 1950. It’s quite the unconventional club tune and I didn’t see it becoming a smash here but I probably shouldn’t have bet against a song that has hit number one in over 10 different countries. I still don’t really get it. The music of Mumford and Sons falls under the category of “indie folk” which, despite enjoying this song greatly, makes me a little surprised to see it on the Billboard Charts and rising. According to the wonders of wikipedia, the indie folk genre includes Bright Eyes, Sufjan Stevens, Cat Power, Iron & Wine, Bishop Allen (whom I also greatly enjoy) and others. The 5 artists (I know Bishop Allen is a band) that I just listed have a combined zero songs in their Billboard Chart history. They have lots of albums on the album charts but no singles hit. There could be a plethora of reasons for this (see last week’s rant) but Indie Folk isn’t a genre that gets much love on the charts. Congrats to Mumford & Sons for breaking out. Ouch. It seems all the lustre of a shiny new track from the Wizards of Waverly Place girl has died down in a big way and the song plummeted 30 spots. A queer little thing happened with this song during its run on the charts, which seems to be quickly coming to a close. Somewhere down the line, it lost its “featuring” tag. The song features vocals from Taylor Swift. With all the recent hoopla around T-Swizzle with the new album release and the barefoot, Kanye-blasting VMA performance, one would think that John Mayer’s record company would want to push the fact that she’s on this song to its fullest extent. Instead, her name has slowly vanished from the marquee and the song, well, it faltered after its debut at #25 and never got any higher. At first, I couldn’t see the appeal in this song. Maybe it was some leftover Train hate from back in the day when their big song rhymed “room to grow” with “does Tae-Bo”. But after a while, the song grew on me and now I’m rooting it on for its landmark week. If the song can avoid dropping below #50 next week, it will have been on the Billboard charts for 52 weeks. An entire year. Only one other song on the charts right now can claim that- “Need You Now”, which is going into its 58th week on the charts which lands it in the top 10 longest running songs in the Hot 100’s history. Jason Mraz has the record as “I’m Yours”‘ chart run was a mindboggling 76 weeks. It’s funny what a little revisionist history can do. In listening to the radio, I’ve heard this song touted as the big return of Kings of Leon. And yes, this is their first big hit since their colossal success with “Use Somebody” back in 2008. Here’s the thing, it’s not as if they didn’t release singles between point A & point B. They did. Three of them to be exact. There was “Revelry” which went Gold in Australia but couldn’t crack the charts here. There was “Notion” which was a #1 on the Alternative Rock charts but only made it to #99 on the Hot 100. And then there was “Crawl” which fared the least well of the 2009 singles. But if you mention that the new song doesn’t sound like a big return after a year’s absence and doesn’t get that extra little push from fans who go “Hey, Kings of Leon are back” when in fact, they never really left. Putting out a new album does wonders for a band on the Billboard charts. Take Linkin Park and their new album “A Thousand Suns”. The album came out on 9/14 and this chart is the first chart to feel the aftershocks. And it was quite a big one as the Catalyst shot up from #73 to #27. That was a surprising leap but not the biggest of the week. That goes to “Dog Days Are Over” which took off like a rocket from #93 to #21. Part of both of these songs success can be given to their VMA performances. But I think there’s something more here. Both these songs are anthems about overcoming the bad times in life. I think people need that right now. 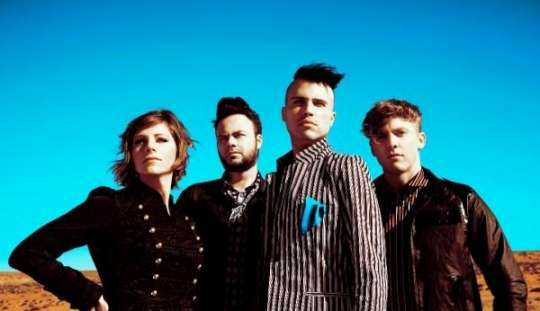 Neon Trees' "Animal" has crawled up the charts for 16 weeks. It's up to #22. Allow me to take a moment to discuss Katy Perry and the recent Sesame Street drama. I feel bad for her because she was legitimately excited to have her song on Sesame Street and now it won’t because some people made some negative comments about how revealing her outfit was. Now, here’s the thing- Sesame Street (according to the wonders of wikipedia) has a 4 person wardrobe team. Are you telling me that none of the 4 people thought putting big breasted Katy Perry in the tinkerbell dress in a scene where she was going to run after Elmo may cause a slight problem? Someone there screwed up. Plus, it’s Katy Perry. They should have known what kind of attention they were going to get. Have they not seen the California Gurls video? Maybe this is a brilliant ploy by the CTW. This is the most publicity Sesame Street has gotten since they trashed Big Bird’s nest in a hurricane. Top ten! This song is the perfect formula for a club banger. Take a pair of Bay Area DJ’s and give them a song to work with. That song was “Booty bounce” by Dev. They took one of the verses and made it into a chorus with a killer hook and surrounded it with a great beat. Now they just needed a chorus. Add in Far East Movement, an asian quartet who have been quietly making waves on the club scene since 2003 and ta-da, one big hit. What’s up next? FM is going to tour with Lady Gaga! I was beginning to wonder what was going on. I know Rihanna is still making big hits. In fact, her song with Eminem is still lingering at #2. But here’s the thing, her last two singles have not done so well. “Rockstar 101” despite a performance on American Idol and guitar work from Slash of Guns & Roses/Velvet Revolver fame was only able to peak at #64. While her song “Te Amo” was a solid hit in Europe but for some reason wasn’t released in the states. But she’s got a new album on the way called Loud. The song debuted last week at #75. I was wondering if it was going to meander in the bottom 50 like “Rockstar 101” did. Clearly, it did not. This entry was posted on September 28, 2010 at 2:35 pm and is filed under Chartbreaker. You can follow any responses to this entry through the RSS 2.0 feed. You can leave a response, or trackback from your own site.